Town council is composed of seven individuals (Mayor, Deputy Mayor and five Councillors) who serve for a four-year term. The current Council was elected in the fall of 2017 the next election is in the fall of 2021. It is Council’s responsibility to oversee the Town’s policy development and ensure, through the Chief Administrative Officer, that policy is implemented by the Town’s Administration. Council also sets the annual operating and capital budgets and sit on a number of boards and committees. 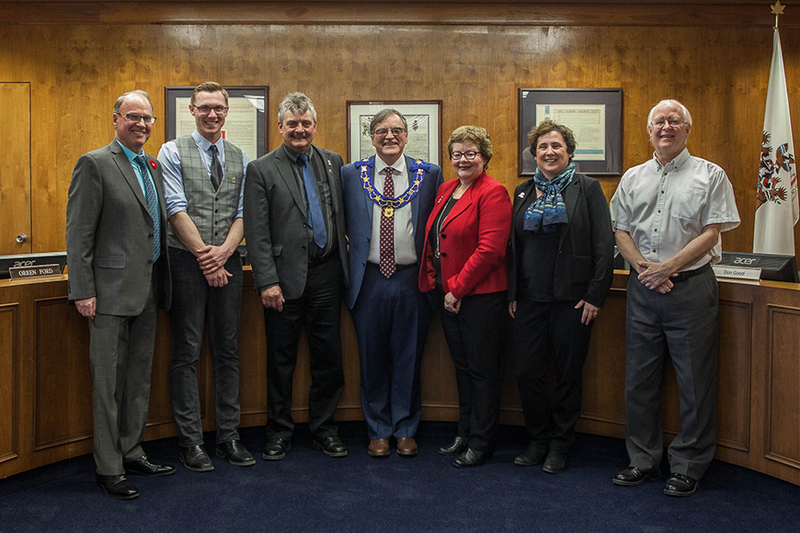 From left; Councillor Colin Needham, Councillor Byron Schamehorn, Councillor Orren Ford, Mayor Tom Tarpey, Deputy Mayor Elain Manzer, Councillor Johanna Downing, and Councillor Don Good. Regular Meetings of Town Council take place on the second and fourth Mondays of each month, working policy meetings, called Governance and Priorities meetings, meet on the first Monday of each month. All meetings are open to the public and commence at 5:00 pm in Council Chambers, unless otherwise noted. During each meeting there is a designated time for public comments scheduled towards the end. During that time members of the public are invited to comment (two minutes in length) on a topic of discussion listed on the meeting’s agenda. Additionally, you can request that a discussion item be brought before Council, to inquire about bringing an item before Council either as a presentation or as a request for discussion please contact the Executive Assistant to the CAO and Council via the form below or by calling 780-624-2574. All requests must be received before noon on the Wednesday preceding the Council meeting you wish to present at. Please note all items submitted to Council are public. Council meetings are voice recorded and published. By following the link above you can access council agendas and minutes from the most recent, to as far back at the year 2000, more will be made available as they are digitized. Recent agendas and minutes are posted the Thursday before each regular council meeting.